Native species or Indigenous: species present in its natural range or in its potential range (that is, it can occupy area without human intervention). Usually, it lives there and reproduces itself even without the intervention of man. If it extends because of the modification of the environment by man, it always remains considered autochthonous. A strict endemic species is a species whose natural presence is restricted to a small area (mountain, forest, islands, archipelago …). This does not preclude the species being present allochthonously elsewhere. An alien species, exotic species, foreign species, non-indigenous species, or non-native species is a species (plant, animal, pathogen and other organisms) introduced by man, intentionally or not, outside its usual or past natural range or natural dispersal potential area. This definition is therefore opposed to indigenous. Caution: exotic is not heard as coming from distant and warm countries! An introduced species is a species that has been brought into a region in which it does not occur in historical time, that is, outside its initial range of distribution. For some it is necessarily an exotic species, but the definition can also be considered less strictly. At the beginning of the process, it is more accurate to speak of introduced individuals. A naturalized or established species is a species (specifically individuals of a species) introduced that locally creates a self-sustaining population, that is to say, capable of reproducing and propagating without further human intervention or addition of new genetic material. There are therefore favourable ecological conditions for its sustainable establishment over time. The individuals of this population are said to be acclimatized, they survive in the environmental conditions and to be naturalized because they behave like a native species. A proliferating species or proliferative species will be called a species that, in a given area, becomes abundant, whether indigenous or non-native, without prejudging its impact. There is not necessarily an increase in range. Biological invasion is the sustained increase in the range of a species. This invasion can be natural and spontaneous or linked to the action of man. This broad definition is that historically used by most scientists in the world. But the International Union for Conservation of Nature (IUCN) since 1999 and, following it, various decision-making bodies, have limited the use of the term invasion to invasions of new geographical areas of d’espèces disturbing species, which further detrimentally affect biological diversity. The anthropogenic origin of the invasion process is also underlined. The sense of invasion then goes beyond the common or traditional sense of the word. The notion of invasive species can therefore be understood differently depending on whether one takes into account its natural or anthropic origin and especially its impact on the species present initially. Most of these definitions may suffer from a lack of temporal considerations (species and their natural range have not been fixed, if only because of the last glacial period). Thus, Pascal et al. (2006) consider that for France (geographical entity in question) can be called “indigenous” species present at the beginning of the Holocene (-9200 BC) and therefore non-native species the ones absent at that time and then arrived later. Some of these definitions may also encounter difficult cases: individuals of a species may be introduced by humans into the natural dispersal potential area of the species, that is, they may potentially be joined by individuals considered as indigenous… What status should be given to established populations? And how to define a natural dispersal potential area? And an invasive alien species? According to the International Union for Conservation of Nature (UICN), Invasive Alien Species (IAS) are animals, plants or other organisms introduced by man accidentally or deliberately outside their range of natural distribution, where they settle and disperse, causing a negative impact on local ecosystems and species. Invasive alien species can have a negative impact on human health, the economy (e.g. tourism, agriculture) and indigenous ecosystems. These impacts can disrupt ecosystem processes, introduce diseases into humans, flora and fauna, and reduce native biodiversity. There is therefore a significant negative impact standpoint in this definition. This aspect is taken up again today by the Convention on Biological Diversity (CBD, 2002) of the United Nations Environment Program or in the framework of the French national strategy on IAS for which an invasive alien species designates an exotic species whose introduction and / or propagation threaten economically and / or ecologically ecosystems, habitats or other species, thus potentially causing environmental and economic damage or harming human health. So there are impacts or threats when talking about IAS today in an institutional setting. It is estimated to be about 12,000 the number of naturalized alien species reported at any time in the environment of the European continent, of which 10 to 15% are considered to be invasive. A part of these 12,000 reports concerns species naturally present in some part of the continent, but regarded as exotic in another part. However, some of the reported allochthonous populations are now extinct. 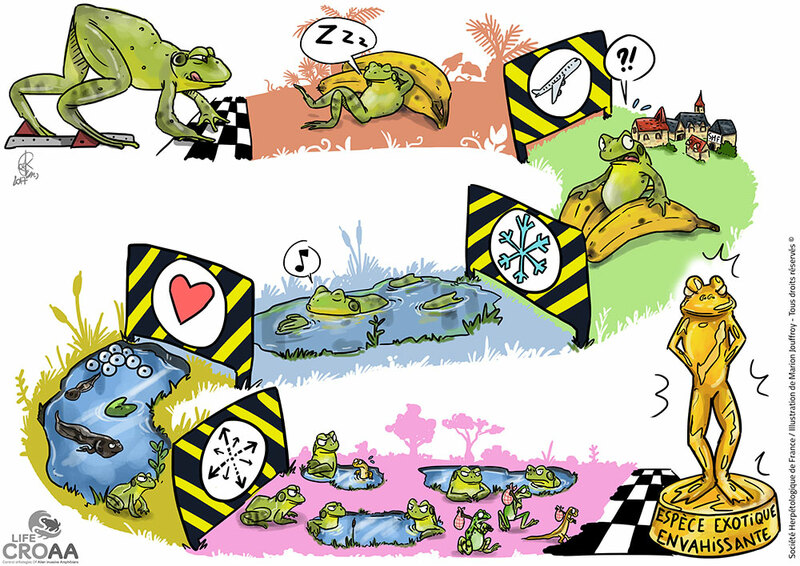 This is the case of the Common Toad in the Canary Islands, as an example. A geographical barrier. The species must be introduced outside its natural range. Most often it was done through human agency. Environmental barriers. Once introduced, the individual(s) must acclimate to the biotic conditions (predators, pathogens, trophic resources) and abiotic (climate, resources, habitats) of the new environment and survive. A breeding barrier. In order for the introduced species to be present over the long term, individuals must be able to reproduce and form a viable population, that is, capable of reproducing and spreading locally without human intervention, intake of new individuals or genetic material. The species is said to be naturalized or established. Sometimes a more or less long process of natural selection has taken place. Barriers to dispersal. Once naturalized, the species can propagate and colonize new spaces only if it has the capabilities, otherwise it remains an exotic non-invasive species. Often (e.g. plants), it occurs in disturbed, unnatural environments. The colonization of more natural environments and more stable ecosystems is another barrier. According to the definition of IAS, invasive alien species will only be referred to as economic, sanitary and / or ecological impacts. Caution: Speaking of Invasive alien “species” is a misnomer, the use of the term “population” is more appropriate. The term “species” includes all populations of the species, both the populations living in the natural range and the introduced populations. It is therefore the non-native populations that can be invasive, those in the natural area may even be in decline! Invasive alien species, by definition, have a negative impact on human health, the economy, ecosystems and / or local species. These impacts can disrupt ecosystem processes, introduce diseases into humans, flora and fauna, and reduce biodiversity. They can be demonstrated or suspected. Impacts on human health or flora and fauna or the economy are of course often the easiest to identify. If the example of pathogens such as the smallpox virus is well known to have been conveyed during conquests and introduced into new territories where it killed a considerable number of people, other cases of human health impacts of IAS are known (mosquito tiger and about thirty viruses, common ragweed and respiratory allergies, black rat and leptospirosis, etc.). Many IAS impact agricultural production (Colorado potato beetle, Asian hornet, leaf mining fly Napomyza gymnostoma, etc.) and motivate the use of pesticides which can also have effects on health and ecosystems… In aquatic environments, IAS, when they proliferate, can threaten the cooling systems of power plants, weaken the banks, reduce tourist traffic etc. The impact on biodiversity is not always easy to assess but some examples are well known in endemism settings where the impact is greatest, as is the case with the brown tree snake Boiga irregularis, which has become invasive on several Pacific islands in where it has eliminated at least two species of endemic birds and has a health impact, since hospitalization is necessary when a child is bitten. According to IUCN, invasive species are involved in almost half of the species documented extinctions, and are even the only factor in 20% of the documented cases. The disappearance of species is of course an extreme case of the impact of an IAS on biodiversity and fortunately uncommon, but local biodiversity is very often reduced. For example, Argentina’s ant (Linepithema humile), can destroy the colonies of indigenous ants where it settles, which can affect indigenous plants, the myrmecophagous lizard (Phrynosoma coronatum) in California, which is already in pronounced decline, disappear from habitats where indigenous ant species are no longer available (Suarez & Case, 2002). Freshwater ecosystems are particularly sensitive to the introduction of exotic species. The organisms that live there are for the most part specialized and the habitats available are often of small surfaces or volumes, functioning almost as insular environments. In 1999, for the United States, the economic cost of IAS was estimated per year at $ 137 billion. In continental Europe, the cost of damage and management is estimated in 2008 at more than 12 billion euros, but it is probably higher.